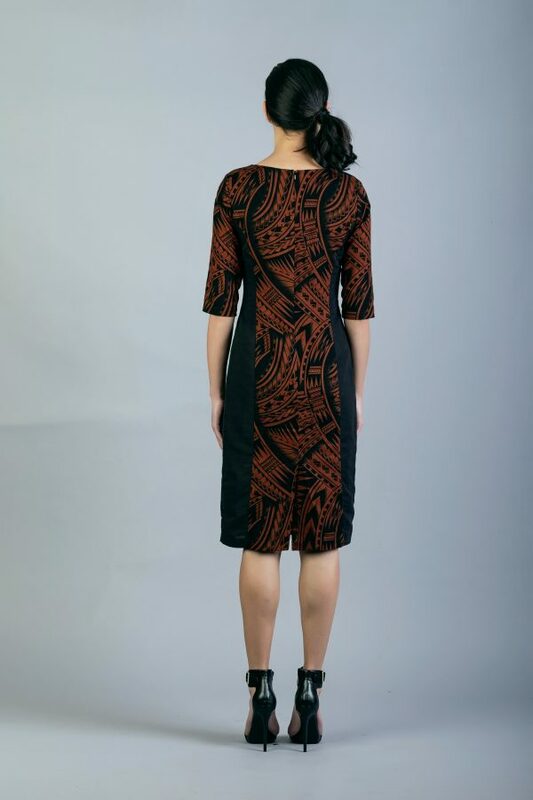 This orange and charcoal coloured dress features Pacific motifs. A classic style, with sleeves, lined, darts running through the midline front and back, giving you a semi fitted dress suitable for the office or a special occasion. Model is 5’8” and wearing size 8. Cold hand or machine wash. Wash with similar colours, warm iron, do not bleach, dry cleanable. 100% polyester, lining: 100% polyester. This two toned style has a back to 60’s retro look. A contrasting look on the front, with daisy and striking geometric shapes and a mid waist cut style. The entire back is daisy print. 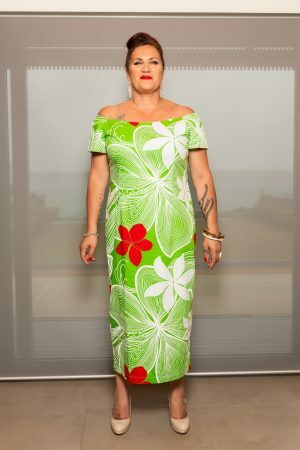 This dress is short sleeved, has an invisible zip, a slight flare at the side and lined. Model is 5’10” and wearing a size 10. This is the traditional long skirt design which is usually worn under a dress to complete a cultural attire look for that special occasion. Front left trim edged with a frill. A long thin fabric is created as the band to tie around the waist. This is made to order and comes in 2 lengths only – 1.5 meters and 2 meters. Note: We estimate a 10 day turn around for the order. 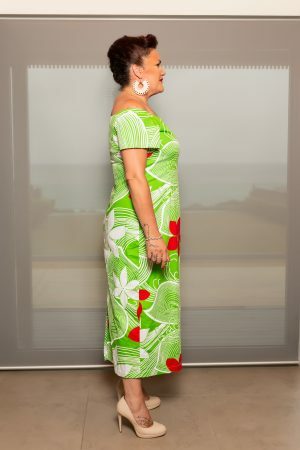 Dynamic with a pacific edge, straight from the boardroom to an after work event or wear to that special cultural occasion. 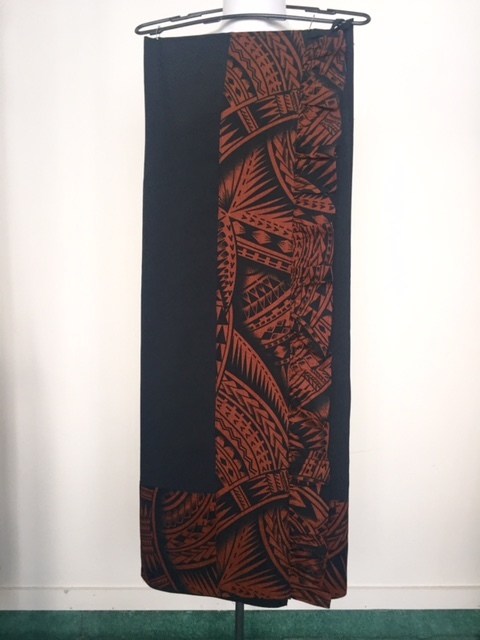 This number portrays pacific motifs and panels are of cotton and linen fabric. 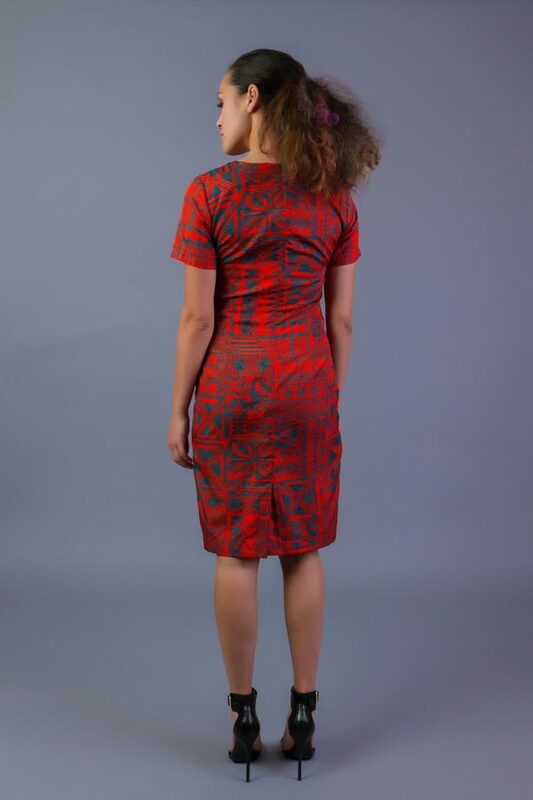 A very close fitted, panelled straight dress with elbow length sleeves and round neckline. It is lined, back with invisible zip opening and slit at hem. Model is 5’7” and wearing size 8. This eye-catching darted off the shoulder dress with short sleeves, falls full length to the ankles. Invisible zip on centre back of dress and fully lined. One too have for that special occasion. Model is 5’9” and wearing size 18. 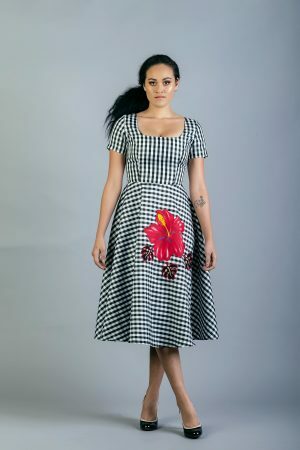 Black and white checks with appliqué hibiscus makes this a striking number. A close fitting bodice with a square neckline. 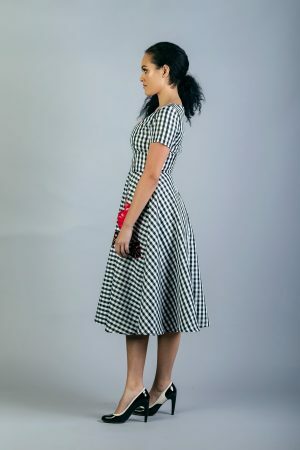 It has short sleeves, a half circle skirt and falls to mid-calf length. Invisible zip on centre back and cotton lined. A fun dress for that special outing. Model is 5’8” and wearing size 10. Light cotton full length dress with high gathered neckline and binding that ties at the back. Wide waist panel, flared skirt with split over left leg and lined. An elegant wear with a relaxed style for that summer occasion. Model is 5’10” and wearing size 10. Hola to all the ladies. 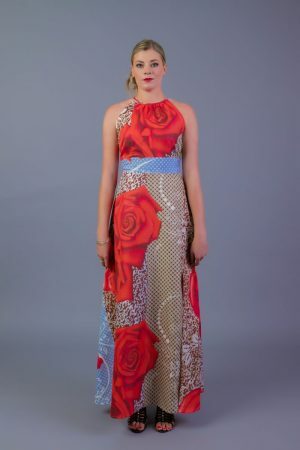 Here’s a classic take on black and white stripe, with a red champagne floral print flowing through. 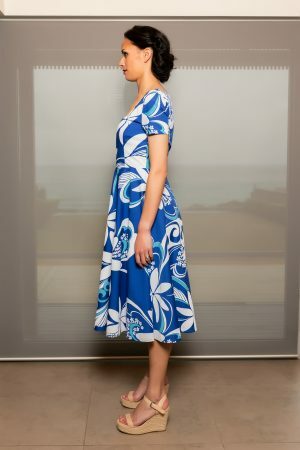 A darted straight dress with waist inset and neckline yoke. Invisible zip opening, slit at back hem and lined. Model is 5’10” and wearing size 8 (fitted). This earthy tone print is perfect for the office summer day look. It wears as a straight silhouette falling just below the knee, lined with darts at mid-waist front and back neckline with raglan short sleeves. 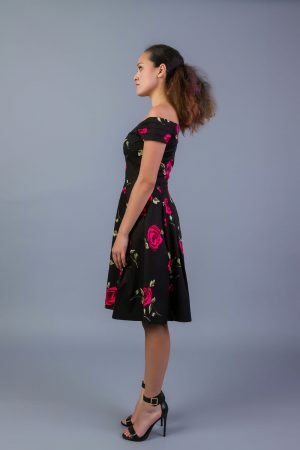 This bright pink rose fabric has taken on a 1940’s swing dress style. This off the shoulder fitted bodice & pleated flared skirt has side pockets. Pleated off the shoulder cap sleeves, invisible zip on centre back and lined. 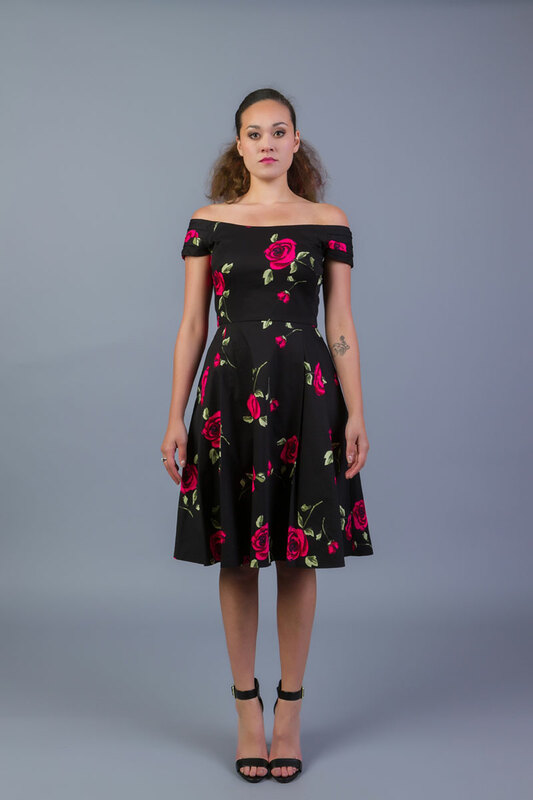 This half circle midi length dress is striking and has a close fitting bodice with square neckline and short sleeves. It is lined with an invisible zip on centre back. A real stand out number. Model is 5’7” and wearing a size 8. © 2018 The Colour Closet. All Rights Reserved. Website design and maintenance by LimeRed.